This is disturbing on many levels. Some Australian comedians thought it would be cute to sneak to past security that is protecting a world leader. We've suffered terrorist attacks and Presidential assassinations. Trust me guys, not funny. Members of an Australian TV comedy show, one dressed as Osama bin Laden, drove through two security checkpoints Thursday before being stopped near the Sydney hotel where President Bush is staying. The stunt embarrassed Sydney police who have imposed the tightest security measures in city history for a summit of leaders from Pacific Rim countries, including Bush. Police arrested 11 cast and crew from the TV program, "The Chaser's War on Everything," and impounded three vehicles, the Australian Broadcasting Corp., which airs the show, said on its Web site. Cast members put together a sham motorcade, hiring two motorcycles and three large cars on which they put Canadian flags. Police waved the motorcade through two checkpoints before pulling it over near the Intercontinental Hotel where Bush is staying. Cast member Chas Licciardello got out of the car dressed in a white tunic and cap and wearing a long fake Osama bin Laden-style beard. "No particular reason we chose Canada," cast member Chris Taylor was quoted as saying on The Sydney Morning Herald's Web site. "We just thought they'd be a country who the cops wouldn't scrutinize too closely, and who feasibly would only have three cars in their motorcade — as opposed to the 20 or so gas guzzlers that Bush has brought with him." Bush is a frequent target of "the Chaser," as are Australian politicians. 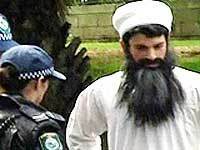 Foreign Minister Alexander Downer said the stunt proved security was working. "Whatever you think of the humor of 'the Chaser,' the honest truth is they were clearly not going to harm anybody in a physical way," Downer said. "They presumably were, as is the nature of their show, aiming to humiliate a lot of well-known people." To frighten people into thinking they're in a life threating situation is dangerous. Perhaps not coincidently, frightening people is the modus operandi of the jihadists as well. Trackposted to Outside the Beltway, Blog @ MoreWhat.com, Perri Nelson's Website, Rosemary's Thoughts, DeMediacratic Nation, Big Dog's Weblog, Right Truth, Nuke's News & Views, Shadowscope, Webloggin, Cao's Blog, Leaning Straight Up, Conservative Cat, Conservative Thoughts, Pursuing Holiness, third world county, Right Celebrity, Faultline USA, The World According to Carl, Pirate's Cove, Blue Star Chronicles, The Pink Flamingo, CommonSenseAmerica, High Desert Wanderer, Right Voices, Gone Hollywood, and The Yankee Sailor, thanks to Linkfest Haven Deluxe.